This is the time of year to make resolutions and set goals for the new year. Your list might include goals like getting in shape, organizing your house, and traveling more. Another popular New Year’s resolution is to get a will or trust in place. Our firm can help you cross that goal off your list and it will be easier than you think. Getting your will or trust done does not have to be a daunting task. Contact Barchet Law today and schedule a complimentary initial meeting. We are friendly, straight-forward and genuinely believe in getting great plans in place for our clients. You can be finished in just a few weeks. It really could be the easiest goal you cross off your list all year! Do I need a buy-sell agreement? If you are asking this question, the answer is probably YES. So, let’s start with “what is a buy-sell agreement?” In short, a buy-sell is an agreement between you and the other owner(s) of your business that lays out what would happen if you or another owner no longer wants to or no longer can continue owning the business. Who needs a buy-sell agreement? Basically anyone with a partner. If you are not the sole owner of your business and you care about what would happen to your share of your business or your partner’s share, you must get a buy-sell in place. 1. One of you wants out. Whether it be because your partner lost his or her passion or the two of you don’t get along anymore, or something else entirely, it is very possible that one of you will want out of the business at some point. Without a buy-sell in place, your business partner can most likely sell his or her interest in the business to anyone. That means that you could end up being partners with the highest bidder. Do you like the buyer? Doesn’t matter. Now you’re partners. If you have a buy-sell, your agreement would stipulate what happens if one of you wants out. The most common setup is that the partner that remains in the business has the right to purchase the departing partner out under pre-agreed terms. 2. One of you dies. Do you want to be partners with your partner’s spouse? What about his or her children? Without the proper planning in place, that’s exactly what will happen if one of you dies. It’s not fun to think about, but bear with me. Suppose you die. If you have no planning in place, your spouse and/or children (depending on your family setup and what state you live in), will inherit your business interest. If you aren’t married or don’t have kids, it will be your parents and/or siblings. Do they even want to operate your business? Many times the answer is no. You know what would make their lives much easier? Money. That’s something a buy-sell agreement can provide. The agreement can essentially obligate the business to buy your ownership interest out if something happens to you. Many times that purchase is funded with life insurance that the business carries on you. That way, the business doesn’t have to maintain a huge cash reserve to fund the buyout. So, if you have a business partner, you need a buy-sell agreement. The money you spend getting that agreement in place pales in comparison to the money, time and grief that will result if you need the agreement but don’t have it. Buy-sells are a funny thing- you do not need it until you need it, and then it’s too late. If you would like to discuss your business in more detail with one of our attorneys, contact us today. We’re pleased to announce that James Ballard has joined Barchet Law as an associate attorney. James graduated from UMKC School of Law in 2013. As always, Barchet Law remains committed to providing excellent legal services to individuals, families and businesses. We are excited to have a new member on our team! If we can assist you in any way, please contact us or call our office at 573-441-9000. Are you going on a big trip? 1. Turn your water off. If it’s going to be cold, consider turning the main water valve in your house off. This will help keep your pipes from freezing. The last thing you want to come home to is a pool in the basement! 2. Let the police department know you’re going to be gone. If you live in Columbia, you can fill out this form online and the police will increase their trips past your house for the time that you’re gone. 3. Execute a power of attorney for child care. If you are going on that elusive child-free vacation, you should consider executing a special power of attorney for your kids’ care. These documents give someone of your choice the power to make medical decisions for your kids while you’re gone. These only last for one year, so if you’ve done one in the past, you may need to do it again. Call our office if you want more information about this. 4. Update or do your wills and/or trust. Going on a big trip or family vacation is one of the most popular reasons that clients contact us to do their planning. Getting your will or trust in place before you leave will give you immense peace of mind. There’s a fancy word for dying without a will in Missouri. It’s called “intestate.” So, what does it mean to die intestate (never got around to doing that will)? It means that the State of Missouri decides how your estate will be distributed. There is a very specific distribution scheme laid out in the Missouri statutes. This distribution is in line with some people’s wishes, but definitely not with everyone’s. If you care about any of the above, and our guess is that you do, you need a will! The process is much easier than you think. Most clients only need to meet with an attorney twice and are finished in a matter of weeks. Contact our office today to schedule your complimentary initial meeting. 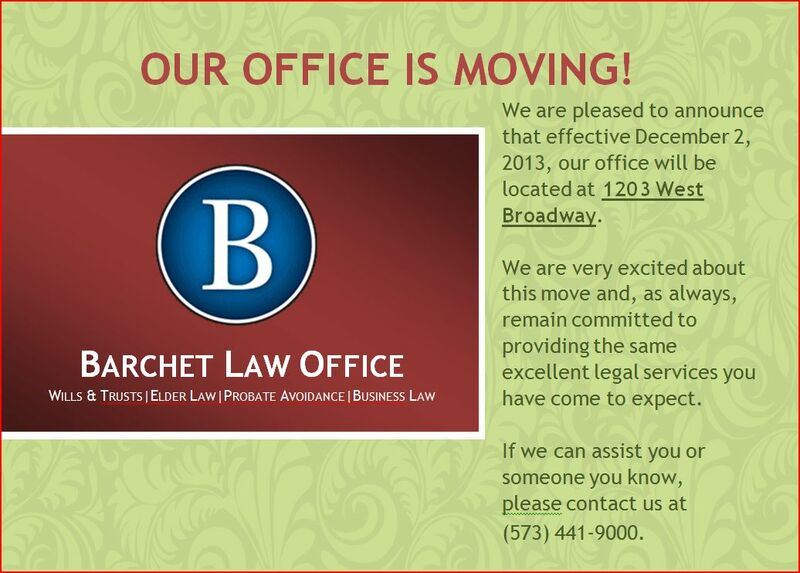 Barchet Law Office is moving! Today is our final post in a series of posts about trusts. See our previous posts here, here and here. Today we continue explaining the advantages trusts can offer. Trusts Can Provide for Minor Children, Grandchildren or Disabled Beneficiaries. Minors and incompetent individuals cannot hold property in their own name, without court supervision. A trust can avoid probate for your beneficiaries and provide for management of your assets for these beneficiaries who are unable to manage assets themselves, which will save thousands of dollars in court costs and legal fees. A trust can hold a beneficiary’s share in trust until a beneficiary can manage property on their own, which could be a period of years, when they reach a certain age, college graduation or for their lifetime. You can choose how long your assets are to remain in trust. Trusts Provide Greater Flexibility. The trustee under your trust will have as much flexibility in terms of the investment, management and administration of your assets as you desire to grant to the trustee. There are no rigid and automatic court imposed restrictions placed on the trustee, like those placed on court-appointed executors, guardians and conservators. As the initial trustee, you are accountable to no one but yourself. Successor trustees are accountable to the beneficiaries of the trust. Only if it appears that the trustees are not properly carrying out their duties can they be required to account to a court. Avoid a multi-state probate. If you have real estate in more than one state, a trust avoids probate in each state. If you have a vacation home, deeded time share, oil, gas or mineral interests, family farm interest or other real property in another state, those assets must be separately probated in that state, in addition to probate in your home state of Missouri (if you are a Missouri resident). Having more than one probate court and more than one set of attorneys involved often is extremely complicated and expensive. If all of these real estate and property interests were titled in the name of your revocable trust, both the Missouri probate and the out of state probate would be avoided. Call us today at 573-441-9000 to learn how you can protect your assets and provide for your family with a trust. Today is our third post in a series of posts about trusts. See our previous posts here and here. Today we continue explaining the advantages trusts can offer. Trusts Avoid Probate in the Event of Death. All assets held in the revocable trust at your death will pass to your beneficiaries without probate. This avoids all court costs and expenses, publicity, delay and restrictions on the management of your assets that would result if your estate were to pass through probate. Trusts have Lower Administration Expenses. There are many requirements of the probate court that will not be necessary with your trust, such as the court filing fees, surety bond premiums, and the minimum executor and attorney’s fees. There will be expenses of administering a trust; however, all fees will be related to the actual work done rather than a minimum percentage set by state law. A Trust Keeps Your Business Private and Avoids Publicity. A revocable trust need not be filed with any court, and the assets in a trust need not be reported to any court, probate office or become part of the public record. A revocable trust provides you and your beneficiaries with privacy regarding your finances and the details of your property, assets and affairs. This is especially important when most probate courts records are accessible online by the general public. Don’t forget to read Part III of this post. Today is our second post in a series of posts about trusts. Last week, we answered the question, “What is a trust?” Over the next several weeks we will explain the advantages trusts can offer. Uncomplicated Asset Management during Life. A revocable trust can avoid probate and manage your assets in the event you become disabled or incapacitated and unable to handle your affairs. In the event of disability or incapacity, the successor trustee that you designated in the trust, takes over management of the trust assets for your benefit. This occurs without probate court involvement or changes to your trust. Avoids Probate upon Incapacity or Disability. A revocable trust is beneficial if you become “incompetent” or incapacitated. Without a trust, the probate court may need to get involved and a guardian and conservator would be appointed by the court to manage your property and personal affairs. Court-supervised conservatorship and guardianship is an expensive undertaking, a matter of public record, and very restrictive. This can be completely avoided with an effective estate plan and if your assets are held and managed by the successor trustee of your revocable trust. Ease of Changing Your Estate Plan. A revocable living trust will act as the master key to your estate plan. You can make any changes simply by changing the terms of your trust. You will not need to contact any banks, life insurance companies or other financial institutions where you have accounts. One change to your trust changes all accounts, property and assets in the trust. This makes it easy and efficient to keep your estate plan current and up to date. Don’t forget to read Part II and Part III of this post.